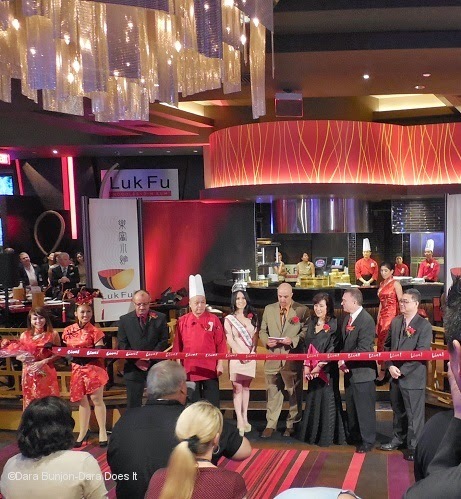 Luk Fu just had its official grand opening in Maryland Live Casino. The open spaced restaurant a step up from the casino floor with an open kitchen format offers up authentic flavors from South East Asia ranging in Dim Sum, Congee, Pho to wok fried and steamed noodles. The 80 seat restaurant including the kitchen bar shines brightly with the colors for luck, joy and prosperity of red and gold. The Chef de Cuisine Joseph Ku brings 30 years of culinary experience from 4 star hotels, restaurants and casino from his native Hong Kong and throughout the United States. A large contingency of the Asian community were at Luk Fu at Maryland Live Casino to support and enjoy everything from the Char Sui Bao, Shiu Mai, Pad Thai, Chow Ho Fun as well as the ceremonial roasted pig. Horseshoe Casino Baltimore today announced that Ruby 8 Noodle and Sushi Bar will join the casino’s extensive lineup of restaurant concepts that will debut when the casino opens in August. Featuring authentic Asian dishes in a contemporary environment just steps from the gaming floor, Ruby 8 will offer gourmet quality cuisine, made-to-order and served quickly. Check out the complete story and slideshow HERE.